Occupational Therapy – What’s it mean for infants, toddlers, and kids? Before I had Mia, I had no idea what occupational therapy might look like for a child. I had a concept that occupational therapists help people regain the skills of daily living. But, what does that mean if you’re too young to have acquired those skills in the first place? It turns out, at least in our experience, that the pediatric occupational therapists still focus on tasks of daily living but in a developmentally appropriate way. And, instead of focusing on regaining those skills, they focus on helping the child acquire those skills. Mia qualified for Early Intervention services when she was just one month old. Her diagnosis (stroke) meant that she was eligible until she turned 3 and aged out of the Early Intervention program. Early on, we worked with a developmental specialist and a physical therapist. 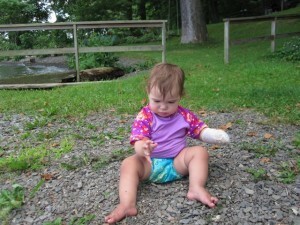 But, as Mia’s gross motor skills emerged very much on track for age, the physical therapist started to increasingly do more occupational therapy things with Mia to focus on developing functional use of her right arm and hand. Through the Early Intervention program, we switched to weekly sessions with an occupational therapist who continued to help Mia work on her grasp and release and finger dexterity in the context of play, using toys that required one hand or two. Bimanual activities and toys are particularly motivating. All the while, I was constantly vigilant to make sense of the therapy she was receiving in the context of my own Feldenkrais training and approach to learning which is rather different from conventional approaches. More on that later in a post focused on Feldenkrais. The Early Intervention program in our area is wonderful. The therapists made house calls or met us at Mia’s daycare. They really got to know us and when we had to switch from one to another, they took great care with the transitions. Mia also saw an outpatient occupational therapist who specialized in constraint therapy from when she was one until she was about two-and-a-half. We saw that therapist every few months for ideas related to constraint therapy, which is yet another post. 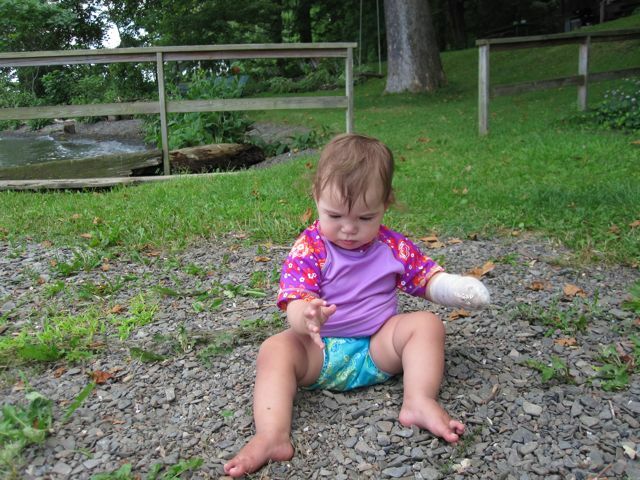 The picture that leads this post is from our first experiments with constraint therapy. I wrapped Mia’s lefty all her waking hours that week of vacation and let her spontaneously discover more of her world with righty. Last spring, we went through a formal “Turning Three” process of graduating from Early Intervention and so now Mia receives services through the public schools. Our town has a public preschool and while Mia doesn’t go there for school, she goes once a week for a 30 minute occupational therapy session. Since September, her regular time slot has been 8-8:30 am on Friday mornings. We all go together, Zoe, Mia, myself, and our au pair in two cars so I can go to work afterwards and the au pair can take the girls to their respective schools. Zoe and I get to have some 1-on-1 time while Mia is in her session. Just yesterday, I spoke with the therapist about what she plans to recommend for Mia as her annual IEP (Individualized Education Program) meeting is coming up in a couple weeks. Last year, I was very nervous about the first such meeting. Mia barely qualified for services because she’s so strong functionally. So, I thought the therapist might say that she would end services at the end of this school year. She honestly said she goes back and forth about what to recommend but she thinks that she plans to recommend continuing services at a half hour per week for the next year. She and I both see benefits. Mia likes going there most of the time. Once Mia enters Kindergarten, it’ll be a new set of decisions. Even if she’s deemed eligible, I’ll have to decide if it’s more worthwhile for her to stay in her classroom or be pulled out for therapy. I expect that as she gets older, sports and other activities of her choosing will take the place of these weekly OT sessions but for now, I’m glad to hear they’ll likely continue. This entry was posted in Pediatric Stroke Awareness Month 2013 and tagged au pair, bimanual, constraint therapy, Feldenkrais, IEP, Mara, Mia, occupatonal therapy, righty, stroke, Zoe on May 12, 2013 by mara. Mia had a Feldenkrais lesson with Matty Wilkinson this morning. Note how happy and playful the lesson is. Play promotes learning. The Feldenkrais method has been the most effective of all approaches we’ve used to support Mia’s development. Mia has had lessons with several practitioners since she was an infant. May is pediatric stroke awareness month. Mia had a stroke around the time of her birth. I’m attempting to post daily throughout the month to share tidbits I’ve learned from parenting a stroke survivor. This entry was posted in Pediatric Stroke Awareness Month 2013 and tagged Feldenkrais, Mia, stroke on May 5, 2013 by mara.